Non-hunting family has owned for over 100 yrs. This property has not been hunted in over 50 yrs. 200 acres of whitetail paradise in Macoupin County, Illinois. The farm has four tillable fields totaling 61 tillable acres providing $14,000.00 in annual income. Tillable fields are spaced evenly around the 139 acres of magnificent timber to create the perfect hunting farm. 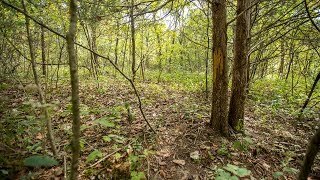 The terrain is gently rolling and includes a beautiful creek dissecting the acreage. The farm has multiple pond sites and fantastic areas for box blinds to overlook the tillable fields. Cut a few trees for income and develop perfect trail system at the same time.